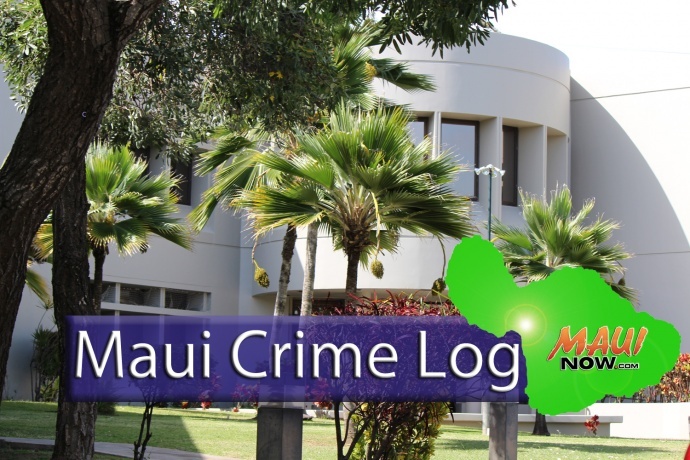 Maui police responded to 14 burglaries, 6 vehicle thefts, and 15 vehicle break-ins in Maui County over a seven day period, between Aug. 7 and 16, 2016. The number of vehicle thefts was down with 6 incidents reported compared to the 18 incident reports a week earlier. The incidents were reported in Ha‘ikū, Hāliʻimaile, Kahului, Wailuku. Three of the vehicles were recovered. Burglary incidents were down to 14 from the 23 incidents reported the week before. Vehicle break-ins were down to 15 from 16 incidents reported the week before. The greatest number was in Wailuku and Kahului, which reported three incidents each over seven days. Monday, Aug. 8 2016, 6:13 p.m.: 800 block of Ha‘ikū Rd. LAJ111 1995 Toyota Tacoma Blue. RECOVERED. Thursday, Aug. 11, 2016, 1:24 p.m.: 800 block of Hāliʻimaile Rd. LET268 1994 Toyota Pickup White. RECOVERED. Thursday, Aug. 11, 2016, 9:13 a.m.: Holo Lea St. M79475 2014 Jonway Moped Blue/Black. RECOVERED. Friday, Aug. 12, 2016, 8:03 a.m.: Vevau St. 2015 Sym USA Moped Silver. Friday, Aug. 12, 2016, 9:48 a.m.: 400 block of Kele St. LFN405 2015 Hyundai Sonata Red. Monday, Aug. 8 2016, 2:08 p.m.: 1800 block of Kaʻohu St. CM1913 2003 Ford Explorer White.